Daredevil's third season goes from strength to strength with an epic single-take fight and the introduction of a classic villain. This binge review contains spoilers for Daredevil Season 3, Episode 4 to 6. Not caught up? Read our spoiler-free review of the opening chapters here. 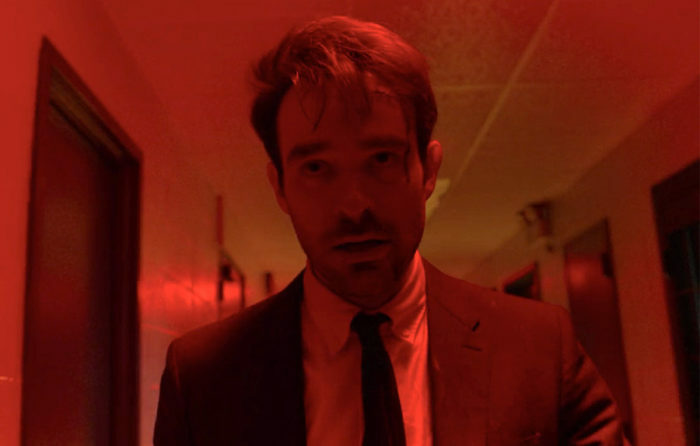 Whoever decided that the third season of Daredevil should return to the characters, themes and plot points of the first season deserves to be shaken warmly by the hand, because the show continues to go from strength to strength as it approaches its halfway point. 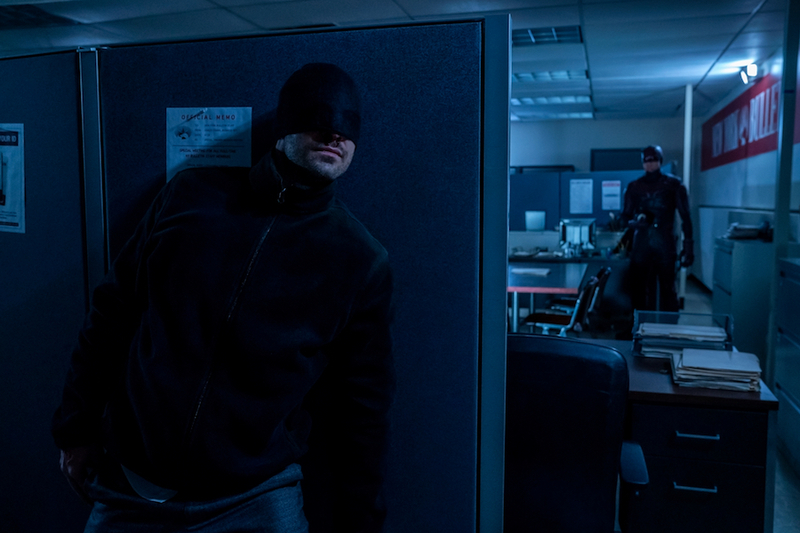 Not only does it top Season 1’s widely acclaimed corridor fight scene, it also introduces a classic Daredevil villain from the comics (and, indeed, the Ben Affleck movie) and leaves you desperate for more, as the sixth episode comes to an end. The show doesn’t bust out its epic fight scene until Episode 4 (for comparison’s sake, the S1 corridor scene happened in Episode 2), but boy, is it ever worth the wait. Using Foggy’s name, Matt infiltrates the prison to try and find out why Fisk turned on the Albanians, but, wouldn’t you know it, he’s walked right into a trap. Fisk calls Matt on the phone and the second he puts down the receiver, he’s attacked, by multiple assailants, in a phenomenal 11-minute fight sequence that appears to take place in a single take (if there’s digital trickery involved, it’s impossible to spot). 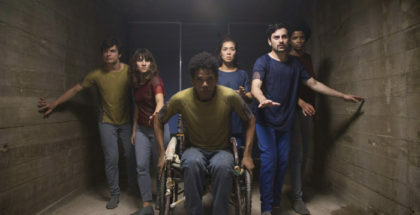 The scene takes place throughout the prison and includes both a lengthy, mid-fight dialogue sequence (thereby actually advancing the plot) and a full-on riot sequence. Cox delivers an incredible physical performance (even if you can spot the bits where he swaps out with his stunt double if you look closely enough) and it’s a testament to the scene’s astounding achievement that the actor is heavily out of breath by the end of it all. Things go from bad to worse for Matt, though: no sooner is he out of jail than Fisk tries to kill him yet again by arranging for his cab to be locked and driven into the water (one of a number of scenes lifted directly from the Born Again run in the comics). Consequently, Matt’s barely in the fifth episode (The Perfect Game), which is just as well, as he probably needed a break after filming that fight scene. 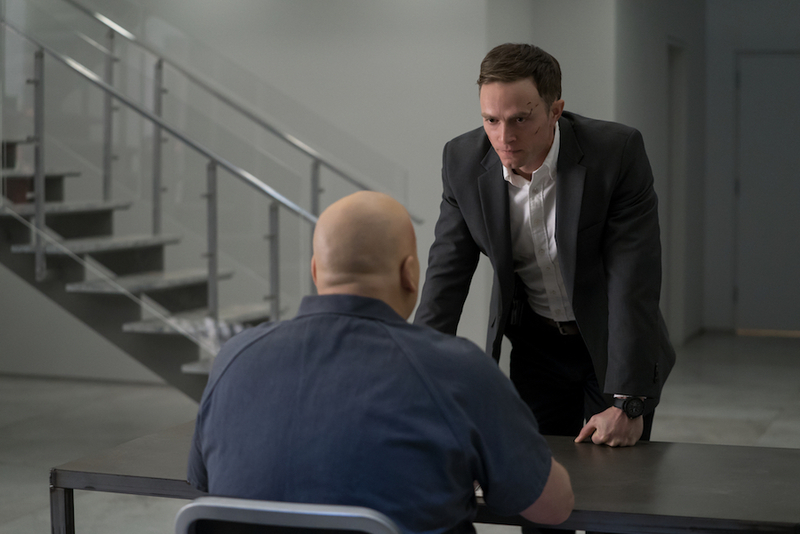 Instead, the episode focuses on FBI Agent ‘Dex’ Poindexter, with Fisk getting his hands on Dex’s therapy files and then using that information to subtly manipulate him. Dex’s flashback story is inventively staged: black-and-white scenes depicting traumatic moments from his childhood play out on screen, with Fisk sitting in shot and observing (in reality, he’s reading Dex’s psychotherapy transcripts). The moment young Dex kills his coach with a well-aimed baseball, his true identity clicks into place (at least, if you had somehow managed to remain unspoiled thus far) and we realise we’re watching Bullseye’s origin story. To that end, there are a number of nice little touches, such as the bullseye logo on young Dex’s baseball cap. In the present-day scenes, Dex continues to be a fascinating figure, thanks to a smartly judged performance from Wilson Bethel that doesn’t give too much away. We learn from his therapist that he needs moral guidance, a “north star” to keep him on the right path, which sheds some light on why he appears to be stalking a local woman he’s fixated on. However, when she rejects him, he begins to spiral out of control, which makes him easy prey for Fisk’s manipulations. 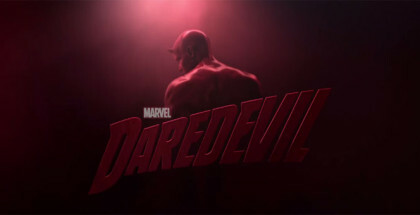 The sixth episode (The Devil You Know) makes Fisk’s plans for Dex explicit – he’s a loaded gun that he intends to aim squarely at Daredevil, which he does by giving Bullseye a Daredevil suit and ordering him to kill the witness that Karen has sequestered away at her newspaper office. This sets up a terrific Daredevil vs “Daredevil” fight, which has the pair going one-on-one, with Bullseye flinging all manner of random objects at Matt throughout. 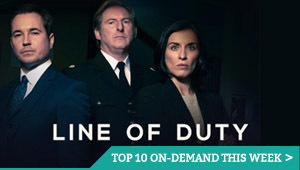 It’s genuinely thrilling to watch and leaves you drooling with anticipation for what’s to come, if things can be this good at the halfway point. Fisk’s manipulation of Dex is both provocative and relevant, because it’s not hard to see parallels with the real-life radicalisation of angry white men. Fisk nurtures Dex, effectively giving him permission to release his pent-up anger, and the results are predictably explosive. However, Fisk’s intentions are purely self-serving – in addition to being his hired gun, he plans to use Bullseye as a distraction, allowing him to continue his criminal activities while the police and the FBI are busy elsewhere. Speaking of Fisk’s ultimate goals, the Born Again comics run (on which Season 3 is largely based) focuses on the Kingpin systematically destroying Matt’s life, once he discovers his secret identity. We get another explicit nod to that here, when Fisk attempts to frame Matt by naming him as a crooked lawyer accomplice in his own case. That leads to the FBI investigating Matt’s private life, which panics Karen because she has her own secrets to hide (notably, her murdering Wesley in S1). 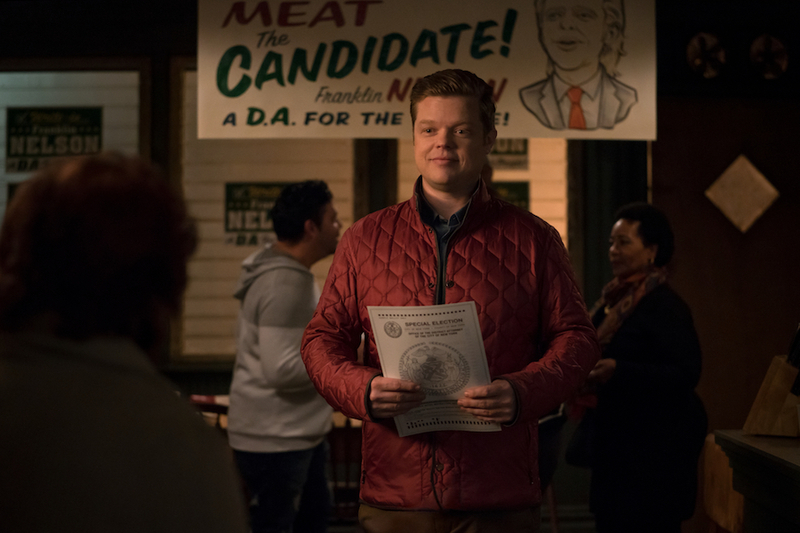 There’s just one other plot point of note and that’s Foggy announcing that he’s going to run for District Attorney, on the specific platform of getting Fisk sent back to jail. Yeah, that’ll work out just fine. 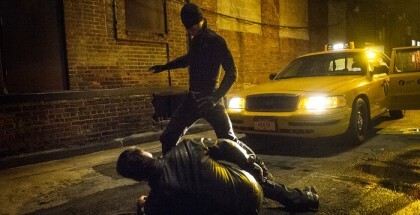 In summary, Episodes 4 to 6 kick Daredevil’s third season into high gear, delivering a pair of phenomenal fight scenes and setting up an intriguing three-way conflict between Daredevil, Bullseye and Fisk. Thank god we don’t have to wait a week between episodes.